I love baking with oats, as this site will continue to reveal. I eat oatmeal for breakfast almost every day, just for how awesome it is. Transfer that into a muffin, and I’m sold. Step aside, Wheaties. So how could you go wrong with having walnuts and honey in there as well? These are a fantastic hearty wholesome muffin to start the day off with. I gravitate towards using large muffin tins, but you could do 12 regular instead of 6 large. Just reduce the baking time by about 5-10 minutes, depending on your oven. 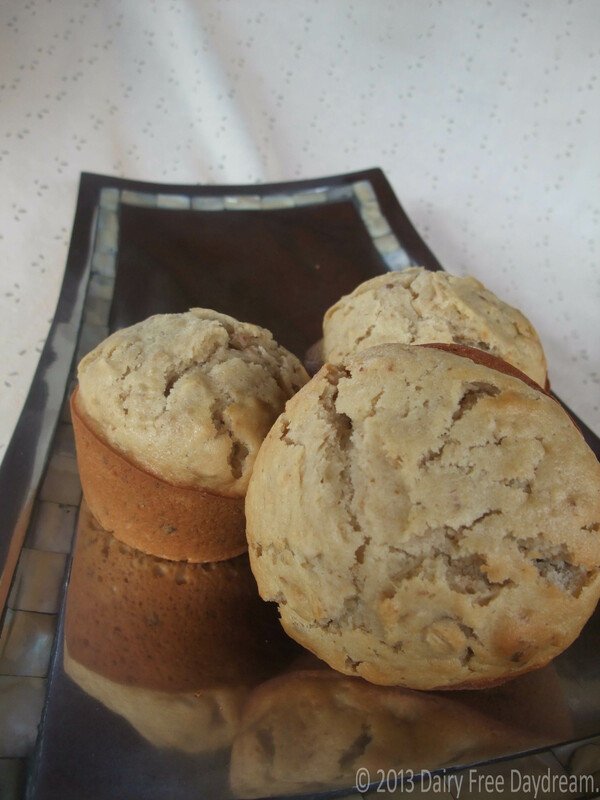 The honey really stands out in this muffin, which I enjoy a lot. 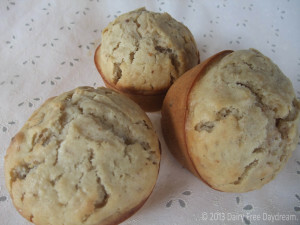 I don’t like that taste in everything, but LOVE it in these muffins. When putting this together, a lot of it came from the thought of turning my bowl of oatmeal into a muffin. granted, we eat some pretty awesome oatmeal around here, so that serves as a good base. 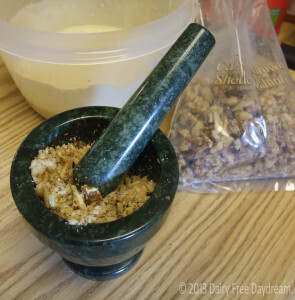 For almost anything with nuts, I enjoy using the mortar and pestle. You can get such a great mix between finely ground that adds flavor, and larger pieces for texture/flavor. Anything to get the pieces to where you want them will work, but anytime you see nuts crushed up in a recipe on this site, more often than not, that is how it was done. Just a great way to start the day, maybe a fruit smoothie to go with. Do we need a post on making killer smoothies? Summer’s not over yet, I’m sure we can make time for this soon. · Preheat oven to 375 F.
· In a large bowl, mix together flour, granulated sugar, baking powder and salt. · In a medium bowl, beat egg, add honey and beat together. 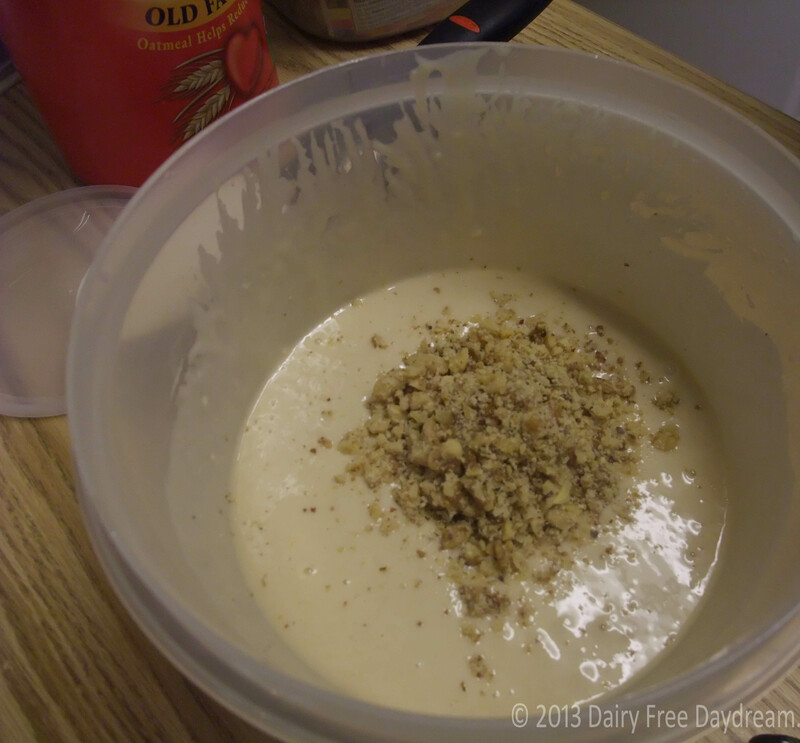 Add in oil, vanilla and rice milk. · Add in baking powder, baking soda, and salt. · Pour wet ingredients into dry ingredients. 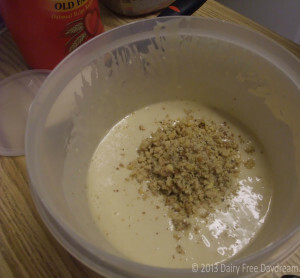 · Fold in oats and walnuts. · Grease or spray large muffin tin. 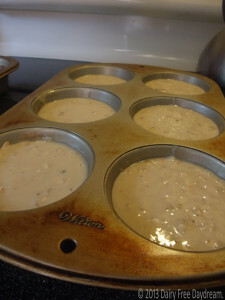 · Fill each of the 6 tins about 3/4 of the way, this should use all the batter. 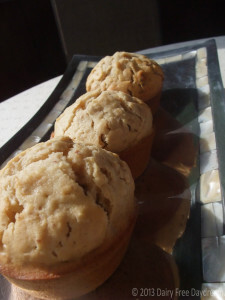 · Remove any excess spray and batter from around the top of the muffin tin (gotta take care of your muffin tins!). · Bake for 20-24 minutes. Enjoy and repeat as needed. © 2019 Dairy Free Daydream.